Every year it seems like Ian Poulter has one of the most anticipated apparel scripts for The Masters. It is always intriguing to see what the king of tartan will be wearing while striding through the azaleas and Georgia pines, and this year is no different. 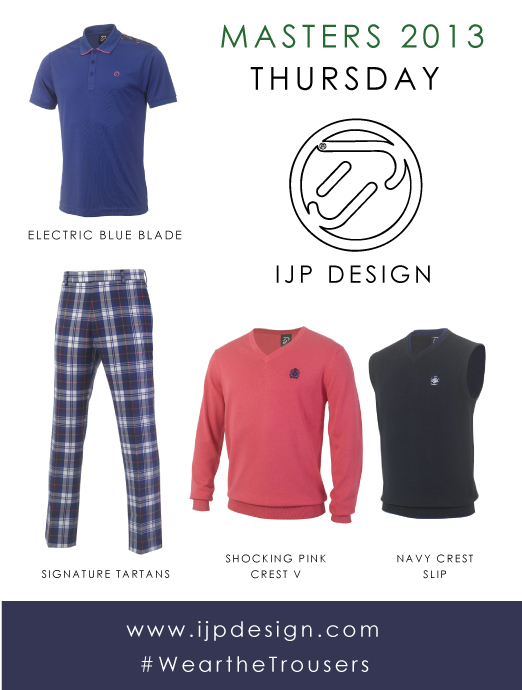 With The Masters coming on the heels of the recent launch of IJP Design’s Spring/Summer 2013 Collection, the year’s first major is the perfect venue for Poulter to showcase his freshest threads. This year’s script features the famous Poulter tartan trousers for the first and final rounds, and wool blend, flat front trousers for the two middle rounds. Each day the trousers are paired with classic-looking polos and either solid, argyle or parquet patterned sweaters. But let’s be honest–with Poulter and IJP Design, it’s really all about the trousers. Check out the complete script below. At least in my opinion, it looks like Poults is saving the best for last. Here’s hoping the fiery Brit is in contention when the final groups head to back nine late on Sunday.